This is howÂ I was pretty sure that Meow Meow Tweet Deodorant Cream will work for me even before using it. No, I didn’t find the deodorant at iHerb even though I wish I did. But I first learned about the deodorant from KimberlylocÂ written by Kim.Â Kim by the way, is one of my favorite green beauty bloggers. Some of you may recallÂ I’d raved about her writing style on my Facebook page. Anyway, I was also thrilled to learn that Kim shares my passion on natural sunscreens and deodorants. I mean, there are many beauty bloggers who don’t blog about deodorants. Search their archives and nary a post about their arms or their pits. Thus, they never made it to my fave list. LOL. So I had Meow Meow Tweet Deodorant Cream on my wish list after reading her post but never got round to getting it. Then, Living Naturally Co., a Singapore-based online curator of naturally formulated indie products got in touch and sent me these, which I’m excited to review. I mean Meow Meow Tweet? The name alone tickles me lots. 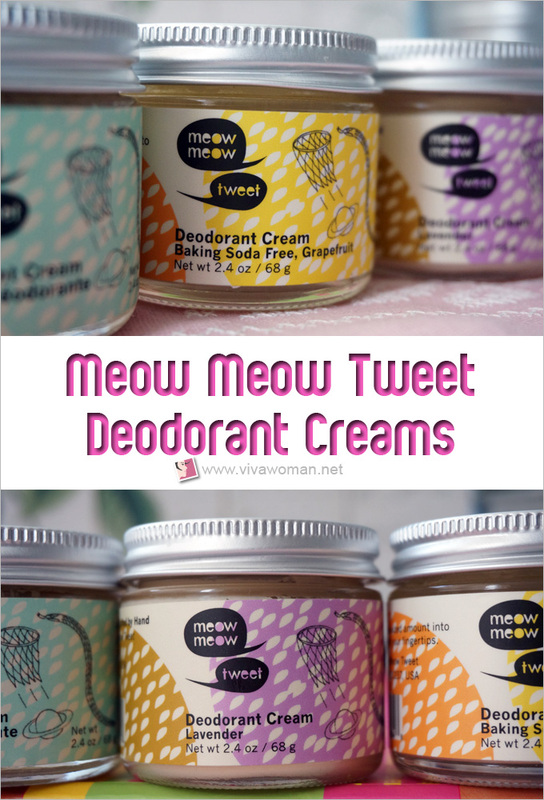 But I reckon many of you may not have heard of Meow Meow Tweet unless you’re a deodorant fanatic. Well, it is one of those small-batch skin care companies based in U.S. They create vegan products (not just deodorants) with organic, unrefined plant oils and butters, steam-distilled and cold-pressed essential oils and organic and wild-crafted botanicals. Interestingly, they said on their website that they develop all of their goods as if they were modern culinary dishes. I’m not sure if they had humans or kitties in mind for those dishes but my guess is both since they’re obviously for animals with their Leaping Bunny cruelty-free certification. 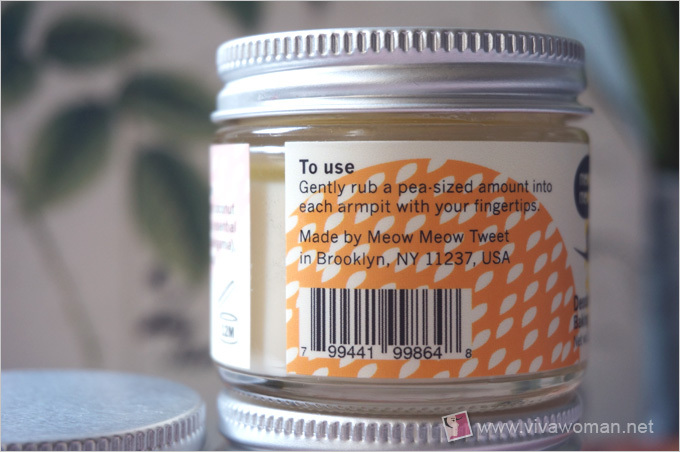 Now Meow Meow Tweet Deodorant Cream is a cream in a jar. So that differentiates it from the roll-on deodorants. 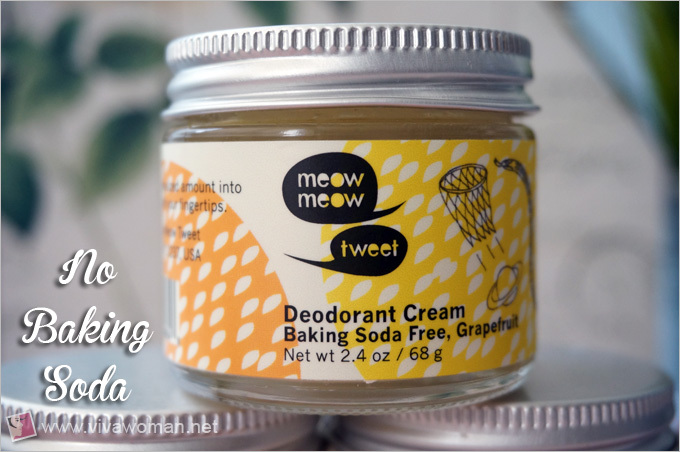 It is more like the other deodorant creams in jars (think Soapwalla and Schmidtâ€™s) but the one difference is,Â Meow Meow TweetÂ also has a baking soda free version. Yup, go ahead and shoutÂ your HOORAYS! 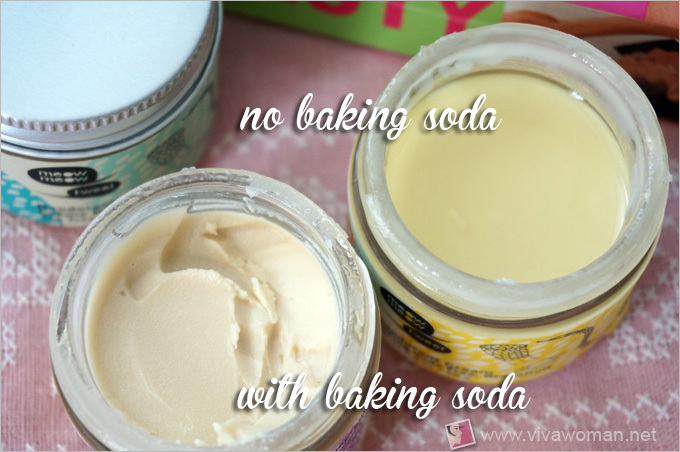 I can handle baking soda without issues but I know many others with more sensitive skin can’t. Baking soda causes their skin to become red and itchy like it’s on fire. So that’s why Meow Meow Tweet created this new formula, perfect for those with sensitive skin and it’s just as effective. They even claim that pregnant and nursing mother can use their deodorant. Wow, that sounds like a clear winner already! Designed without baking soda and clay, this recipe uses dietary magnesium and arrowroot powder to help control moisture and odor. It also includes nourishing plant oils and butters to soothe and condition the skin, and a potent blend of citrusy essential oils to keep armpits smelling fresh throughout the day. Before I received the products, I understood that the consistency of Meow Meow Tweet Deodorant Cream Baking Soda Free, Grapefruit is more creamy because the proportion of oil to powder is higher and it contains no hardeners or waxes. The oil and powder also get separated during hot weather. So I was mentally prepared to stir the contents prior to every use. Performance wise, the classical Meow Meow Tweet Deodorant Cream is excellent in keeping my armpits free of odor even when it got really hot. Meow Meow Tweet Deodorant Cream Baking Soda Free on the other hand is not as potent but still fared well for me. WithÂ Meow Meow Tweet Deodorant Cream Baking Soda Free,Â my armpits survived the scorching hot weather and an afternoon of housework without smelling nasty. But my armpits were certainly wet and so they can’t pass off as fresh. 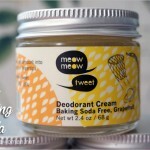 If you were to pick Meow Meow Tweet Deodorant Cream Baking Soda Free and you’re someone who perspires a lot and your armpits get all sweaty, you might need to reapply the Meow Meow Tweet Deodorant Cream Baking Soda Free just to ensure your armpits won’t cause people around you to faint from distress. Since I’ve no issues with baking soda, I don’t mind alternating both types of deodorant creams. On days when it’s really hot, I would wear the deodorant cream with baking soda. On cooler days, the baking soda free version will work well. 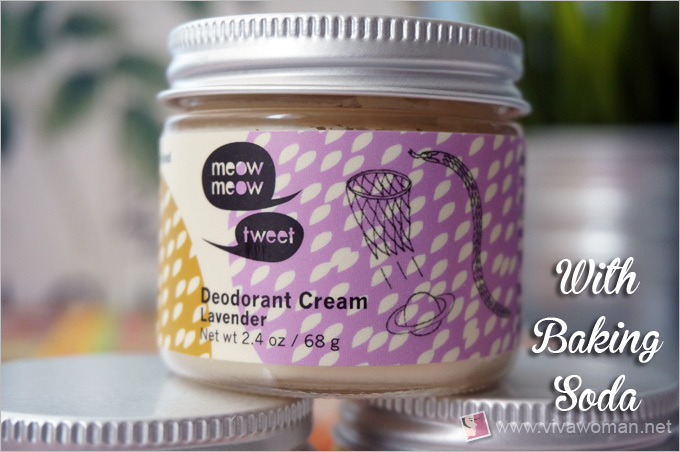 Overall, Meow Meow Tweet Cream Deodorants are worth checking. If you know baking soda is not an issue for you, try their classical version. Those who can’t tolerate baking soda should go for Meow Meow Tweet Deodorant Cream Baking Soda Free version. But be aware that the cream may require stirring before every use if the content separates, something expected of in a hot humid country—a bit troublesome but think of it like shaking a bottle of lotion and you may be more incline to use it. Also, be prepared for wet armpits when the heat turns up. Whether this is a big deal or not really depends on your threshold and to some extent, where you live or spend most of your time in. Personally, I won’t use it outdoors if that’s where I’ll spend most of my time for the day. At first glance, the price of Meow Meow Tweet Deodorant Creams seem more expensive than others in the same category (S$23.90 for 68g in Singapore). But it looks like the size is larger than the others so the price differences may account for little. Between the tea tree and lavender, I prefer the latter. 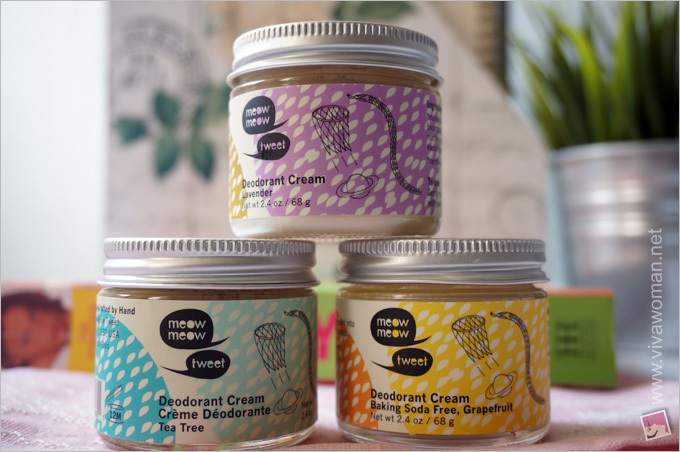 If you’re in Singapore, you can find the range of Meow Meow Tweet Deodorant Creams in Living Naturally Co. They offer shipping outside Singapore too. But I say if you’re in US, check out their original store. Sprays are okay but I get annoyed with them because they tend to drip. Maybe it’s cos I usually spray a lot. This post piqured my interest in the deodorant and got me checking out reviews of natural deodorants. I bought Meow Meow Lavender and Schmidt Lime+Bergamot. Have yet to try the latter but really liking meow meow’s soft and fresh smell and the lasting power is really not bad. If you like citrusy scent you would like Schmidt. I like both but Meow Meow’s feels a bit more moisturizing. HI! is this safe for pregnant women? the weather in SG is horrifying and i cant imagine myself going w/o deodorant when i’m in the office 🙁 Desperately looking for a deodorant that is SAFE for pregnant women! Yes if you go with the fragrance free one. But this one contains baking soda so some people are sensitive to it. 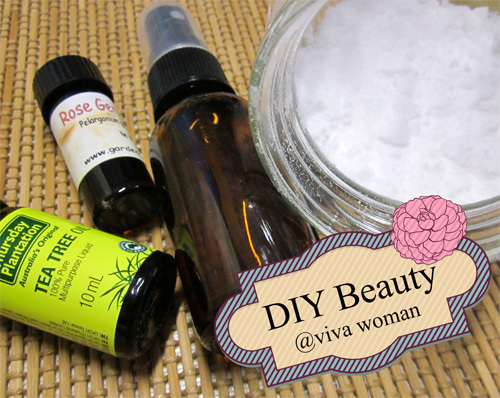 I use this http://www.vivawoman.net/2013/09/real-purity-deodorant-holistic-formula/ which is from iHerb in US. I love it…and they’ve improved their formula. It’s no longer sticky and works extremely well. I’ve used many deodorants to know this one is really a keeper. Hey! Does this deodorant stain the underarms and clothes? No…I didn’t experience any staining.